"Been Workin' on the Railroad," New York Times, Opinionator, February 10, 2012. "Railroads and the Making of Modern America" Art Exhibit opens at the Sheldon Museum of Art, UNL Press Release, January 2012. "Railroads are Subject of Art Exhibit in Lincoln," January 30, 2012, WOWT, NBC. "Sheldon Art Gallery features a variety of new exhibits," Daily Nebraskan, January 18, 2012. NET and University of Nebraska-Lincoln Department of History have teamed up to sponsor a series of community programs called The History Harvest. 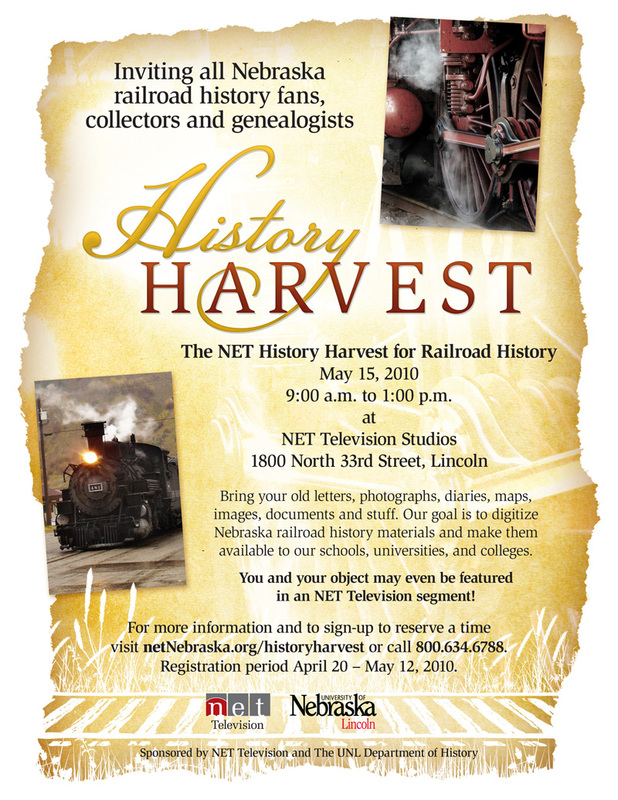 The Railroads project hosted the first History Harvest at NET studios May 15, 2010. Harvesting a digital democracy, Lincoln Journal Star, May 16, 2010. National Endowment for the Humanities awarded the project one of its Digging into Data Competition grants on December 3, 2009. Eight award winners were announced for this prestigious competition. NEH Chairman James Leach offered remarks on the future of digital humanities at the ceremony in Ottawa, Canada--what he called "the new digital class" of scholarship. The project will collaborate with the University of Portsmouth and involve faculty in computer science, history, and geography to develop further models of spatio-temporal visualization. The team will concentrate on railroad worker mobility and tracing environmental impact of railroads in the nineteenth century. UNL News Release, December 4, 2009. "UNL's 'Railroads and the Making of Modern America' to Organize Data," Daily Nebraskan, December 8, 2009. "A 'new digital class' digs into data," The Chronicle of Higher Education Wired Campus, December 4, 2009. "Winners of the First 'Digging into Data Challenge' are Announced," National Humanities Alliance, December 7, 2009. American Council for Learned Societies awarded William Thomas a Digital Innovation Fellowship in 2007 for the project. The fellowship will support document collection and digitization, as well as database development for our worker data set. Economic and Social Research Council awarded Professor Richard Healey (University of Portsmouth) a grant in January 2008 for "Migration, Economic Opportunity and the Railroads: Movement of Heavy Industrial Workers in the North-East USA 1850-1900." The award will support the development of new datasets for the project.